The Republic of Botswana is located in southern Africa, landlocked by Zimbabwe to the northeast, South Africa to the south and southeast and Namibia to the west and north. It is one of the most stable countries in Africa and has a long-standing representative democracy. The country has a good human rights record and has been doing well economically. The production and exportation of diamonds is a key industry which contributes greatly to Botswana’s economy. Safari-based tourism is also important. Botswana's capital and largest city is Gaborone. 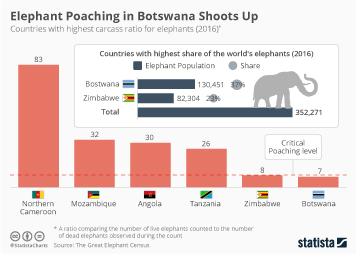 The population of Botswana was estimated to amount to 2.18 million in 2017, and more than half of its inhabitants live in cities. The population growth rate has plateaued a bit over the last few years, after a significant increase, which peaked in 2013. The fertility rate, i.e. the average number of children born to women of child-bearing age, has been decreasing steadily at the same time. This and the dramatically low life expectancy in Botswana are most likely contributing to the decrease in population growth. As of 2015, life expectancy at birth was 65.8 years. HIV has contributed dramatically to its decrease in the country; nowadays, Botswana is still ranked high among the countries with the highest HIV prevalence in the world. However, Botswana has been making progress and the percentage of people with HIV was slightly lower in 2016 than it was in 2000. The economy of Botswana, which is heavily reliant on diamond exports, continues to do well. In 2017, Botswana's GDP was estimated to amount to 16.7 billion U.S. dollars. Most of it is generated by the services sector with an around 60 percent share, followed by industry. Botswana was hit by the economic crisis in 2008/2009, which lowered the demand for diamonds. This dependence negatively impacted the country’s trade balance, but Botswana has since recovered and is out of the red at least, as of 2016. Today, Botswana is the biggest distributor of rough diamonds worldwide. The country also ranks fourth in the world for its diamond reserves, behind Russia, Australia and the Democratic Republic of the Congo. More interesting topics from the industry "Botswana"